Confined by law to the kingdom of Alvair until the age of eighteen, Alexa has lived a sheltered existence under the watchful eye of her sword-wielding guardian, Ivy. Her love interest, Caleb Whitman, is exactly the opposite. A merchant sailor and seeker of rare artifacts, Caleb has lived a life of adventure in nearby San Lucero, the long-time rival of Alvair. 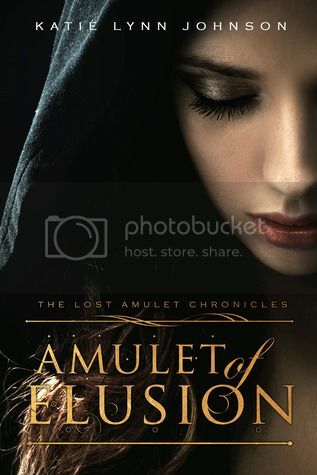 I was given a copy of Amulet of Elusion for my honest review. I took the opportunity to review the book because I liked the topic and story idea, but this one just wasn’t my cup of tea. The plot is great and the characters have great potential, but I couldn’t connect with them or get a feel for the setting. I’d be interested in reading the second book in the series to see where the story goes (and hope that now that Alexa and Caleb are established, the story centers more on the amulets). If you’re looking for a romantic read entrée with some prophecy and intrigued on the side – this one might be for you. Hello friends and fellow book lovers! I am primarily a reader on this site, though I do also write books as a hobby. If you enjoy Fantasy, you may want to check out The Lost Amulet Chronicles. If you prefer Chick Lit, you may be interested in The Cursed Existence of Jessalyn Bell. Currently, I am working on Amulet of Destiny, the final installment of The Lost Amulet Chronicles, which should be ready for publication in summer 2014. When I'm not reading, writing, or working as a graphic designer and copyeditor, I enjoy spending time with my husband and my two rug rats.